I don't play Monsterpocalypse, but some of the miniatures are very nifty. Being a fan of HPL, I picked up the big Lords of Cthul monsters when the game first came out last year. Also, being a Lost World fan, I wanted the giant apes from the Empire of the Apes faction. The hyper form of the monsters come in clear plastic, while the alpha forms are painted. The miniatures came on big square bases with their stats printed on them, which I promptly snapped off. The translucent pink plastic of Ultra Yasheth and Ultra Cthugrosh seemed ideal for representing Cthuloid monstrosities in semi-material form. Cthugrosh with its tentacular lower extremities looks like it is forming out of ectoplasm. The alpha form Yasheth of course is used for a Star Spawn. I don't particularly care for the shade of green that they used to paint the figure, but I am not particularly motivated to repaint it. The giant ape is King Kondo. There is also another giant ape, Gakura, which I'll probably pick up at a later date. The alpha and hyper forms of King Kondo (and apparently Gakura as well) are being sold as a set. 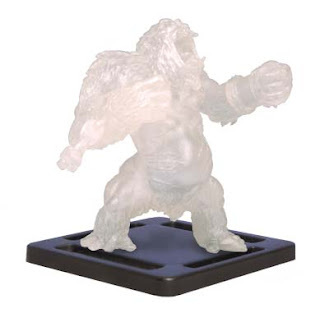 I don't have a need for a transparent ape, so I'll convert this particular miniature by modifying the hand so that it can hold a screaming captive and paint it up. All of the Yasheth and Cthugrosh figures come from the first series, Monsterpocalypse Rise. King Kondo comes from the latest series, Monsterpocalypse Now.